BAKBox 2 - Works with All BAKFlip Covers! Over a million BAKFlips on the road today! Shipped Directly From Our Factory Floor to Your Door! 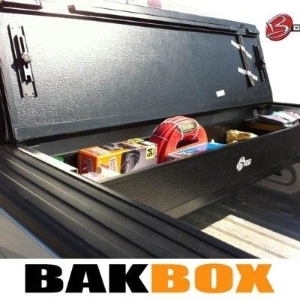 BAKBox- The Cargo Management Solution for ALL STYLES of BAKFlip Covers! A revolutionary new product, the BAKBox! For those still unaware, the BAKBox will do for the toolbox what the BakFlip did for the tonneau cover. In a nutshell, it provides you with a toolbox that is easily folded up to takeup NO SPACE IN YOUR TRUCK when you don't want it. In essence, tt's there when you need it and gone when you don't. Best of all it integrates with any BakFlip Tonneau cover, so you can purchase with your new cover or if you own a BAKFlip, you can easily add this to your cover! The BakFlip panels are the actual lid of the toolbox (BakBox). It is flush mount and completely invisible when installed! BakBox is extremely secure and will keep your contents completely dry! Folds away when not in use or when you need your bed space to load large objects in your truck. Works with tie downs, rails, racks, tonneau covers etc. Way better looking than an old school toolbox. Installs in seconds with no tools! Detaches in seconds so that you can bring your tools or contents with you to a jobsite or picnic site etc. Costs less than an old school box! 1. A toolbox will take up valuable space in the back of your truck!Before rushing down to your local accessory dealer and buying whatever the salesguy is pitching, remember that once your toolbox is on the back of your truck it is there tp say. It's not an accessory that can easily be removed. I mention this as point one, because trucks nowadays can be quite small in the back. If you have a double cab truck, you might want to consider the fact that a quarter of your bed space will be gone once your toolbox is installed. Granted, you get to lock up some items, but don't try to help your best mate move his couch. I'm not sure if that's a good or a bad thing. Just know that installing a conventional toolbox will undoubtedly cause you some grief down the road when using your truck for its primary intention (that is to haul stuff) has now been squandered. 2. A toolbox doesn't always hold as much as you think it does!When it comes to toolboxes, some have gull wings (2 lids) and some have a single lid. I always prefer a single lid, since regardless of what side of the truck you're on, you can always access whatever's insode the box. A gull wing is particularly awkward and also precludes you from being able to put anything long inside the box. When you can only open up or see a 3rd of the toolboxes contents, it's a down right pain the the you-know-what! 3. A toolbox makes it very difficult to use other off the shelf accessories for your truck!Once your toolbox is installed, adding meat and potato accessories that improve your everyday life is somewhat of a nightmare! Simple things like stake pocket mounted tie downs, tonneau covers, bed rails and most better ladder and lumber racks are just impossible to use. They require modifications that void warranties and cause all sorts of other issues. Tonneau covers installed with a regular kind of toolbox will leak and even when they don't, it's very difficult to insulate the permitere of the toolbox. SO you might keep the contents of your toolbox dry, but everything else in the truck will get soaked. A toolbox will cover your stake pocket holes as well, so there go all those advantages too. If you ask me, it's a tremendous amount to sacrifice, just to have an awkward dinosour as a permanent fixture on the back of your truck. 4. A toolbox will turn any truck into a work-truck! It's my contention that more trucks nowadays are used as primary vehicles than ever before. Gone are the days where your Malibu served as your primary ride and your Silverado sat in the driveway and was used as your workhorse whenever you needed it. The truck today is a consolidation of your rides. As such, we find gorgeous leather interiors and stylish exteriors that all speak to the kind of person you are. Just know this and know this well: You can spoil the look of any truck with a monster bling box on its shoulders. Just because your truck is used for work, doesn't mean it should always look like a work-truck! 5. A toolbox is an invitation for thieves! When you have a toolbox on the back of your truck, shining and glistening away for the world to see, it often times says "hey, I've got some cool stuff in me"! It's one of those accessories that denotes the fact that there are expensive tools or valuables stored within. More so than any other accessory, the toolbox is the number one vandalized accessory there is.